January 23, 2014 Physics colloquium: Vyacheslav Turyshev, JPL,"Testing Fundamental Gravitation in Space: Recent Progress and Possible Future Directions"
February 20, 2014 Adler After Dark: Bradford Benson, "Unveiling the Dark Universe with the South Pole Telescope"
March 10, 2014 Statistics Colloquium: Josh Frieman, Fermilab and the University of Chicago, "Probing Cosmic Acceleration with the Dark Energy Survey: Statistical Challenges and Big Data in Cosmology"
April 5 - June 7, 2014 79th Compton Lectures: Elise Jennings, "Cosmic Cartography - Exploring an Expanding Universe"
April 23, 2014 Computations in Science Seminar: Robert Rosner, "Clashing cultures: Science and Public Policy in the realm of Climate Change"
April 24, 2014 Physics colloquium: Adam Riess, "The Hubble Constant and Dark Energy from Supernovae, Cepheids and Parallax"
May 23, 2014 KICP special seminar: Silvia Galli, IAP (Paris), "Constraining fundamental physics with Planck"
June 4, 2014 Computations in Science Seminar: Daniel Fabrycky, "Modeling Perturbed Planetary Systems"
June 9 - 11, 2014 Workshop: "High-Energy Messengers: Connecting the Non-Thermal Extragalactic Backgrounds"
June 12, 2014 Flash Center Special Seminar: Christian Ott, Caltech, "New Aspects of Core-Collapse Supernova Theory"
August 22 - 24, 2014 KICP workshop: "Status and Future of Inflationary Theory"
August 27, 2014 Open group seminar: Giovanni Morlino, Purdue University,"Non-linear shock acceleration and Gamma-ray emission from Tycho's SNR"
September 24, 2014 Workshop: "Structuring Your Scientific Paper"
October 4 - December 13, 2014 80th Compton Lectures: Tim Linden, "Shining Light on the Dark Side of the Universe"
October 17, 2014 GeoSci Seminar: Jonathan Fortney, UCSC, "Towards Understanding the Composition of Exoplanets"
November 5, 2014 2014 Brinson Lecture: Victoria M. Kaspi, "Neutron Stars, a Cosmic Gift"
December 9, 2014 Alyssa Goodman, Harvard University, "Visualization of High-Dimensional Data, and the Paper of the Future"
December 27 - 29, 2014 Yerkes Winter Institute: Robotics, Telescopes and S.T.E.A.M. Doug Watson, "The Dark Side of Galaxy Formation"
Daniel Grin, "Some new isocurvature directions"
Toshihiro Fujii, "Observations of the Universe's Highest Energetic Particles"
Austin Joyce, "Symmetry breaking in the sky"
Nan Li, "Simulations of Strong Gravitational Lensing"
Russell Neilson, "Detecting Dark Matter with Bubble Chambers"
Adler After Dark: Bradford Benson, "Unveiling the Dark Universe with the South Pole Telescope"
The South Pole Telescope (SPT) is a microwave telescope located at the geographic South Pole, which has been used to make the most-detailed measurements ever of the light left over from the Big Bang, the cosmic microwave background. I will give an overview of the SPT, and how astronomers are using data from the SPT to better understand the "Dark" Universe: a component of the Universe that makes up over 95% of its density, but whose physical origin is still largely mysterious to us. 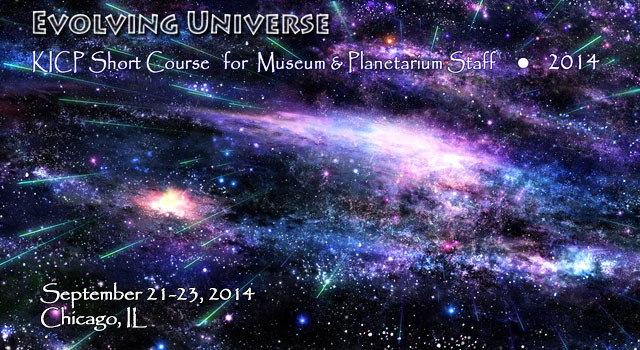 Meet Claudio Ugalde & enjoy astronomy shows, activities, and talks in Spanish. On Saturday, March 8, the Adler Planetarium, in partnership with Latino organizations and Chicago-area institutions, will host Mi Galaxia es Su Galaxia to welcome Spanish-speaking families for a celebration of the universal world of science. Mi Galaxia es Su Galaxia is a one-day event designed to encourage Latino families to experience science together in their own language. 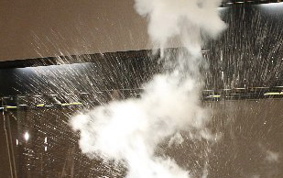 Participants will enjoy a range of scientific experiences presented in Spanish including sky shows, lectures and demonstrations. A diverse group of renowned Latino scientists and local volunteers will be on hand to conduct experiments, lead interactive activities and answer questions throughout the day. 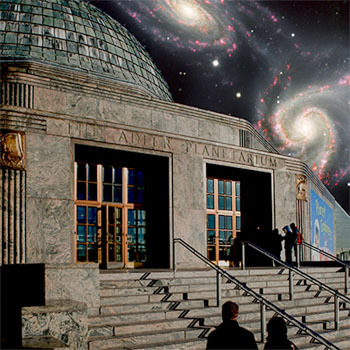 "Mi Galaxia es Su Galaxia will celebrate the exploration our Universe in ways that go beyond borders and language barriers," said Michelle B. Larson Ph.D., president & CEO of the Adler Planetarium. "The Adler is honored to host an international group of renowned Latino scientists, passionate volunteers and local families for a celebration of science." Mi Galaxia es Su Galaxia will offer families the opportunity to view some of the Adler's most immersive shows in Spanish. The Adler's Grainger Sky Theater will transform into a virtual observatory in Cosmic Wonder as photographer, visual artist and Adler Astronomer Jose Francisco Salgado narrates the Adler's blockbuster sky show in Spanish. The Definiti Space Theater will feature One World, One Sky: Big Bird's Adventure. This planetarium show follows Sesame Street's Elmo, Big Bird, and their friend, Hu Hu Zhu, as they explore the night sky. 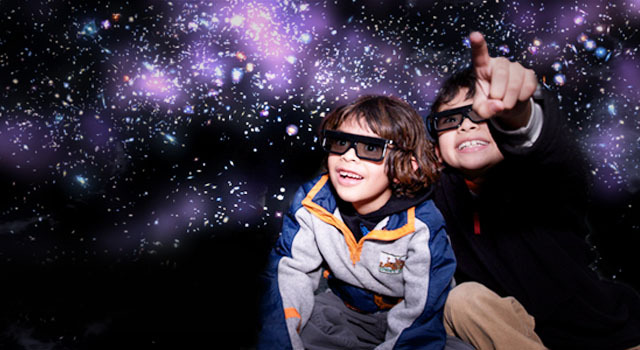 In the 3-D show, Exploding Stars and the Shape of Our Galaxy, audiences will investigate the Milky Way Galaxy and the Pinwheel Supernova. There will be a Q & A with astrophysicist Claudio Ugalde immediately following this show, which will be presented in the Samuel C. Johnson Family Star Theater. 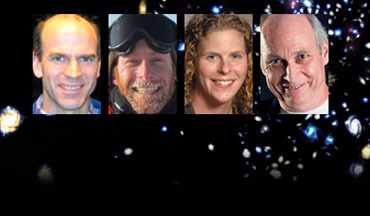 Mi Galaxia es Su Galaxia will welcome a renowned group of scientists who will engage one-onone with Adler visitors. Physicist and professor Juan Carlos Campuzano will describe what superconductors are, how they are made and how they impact our lives. Mexican astrophysicist and professor, Claudio Ugalde, will explore the explosive science of supernovas and how thermonuclear reactions operate in the Universe. Roberto Castillo Ladron de Guevara, lead engineer for the Observatory in Cerro Paranal, Chile, will chat live via Skype from the Very Large Telescope (VLT) to discuss how the placement of observatories in Chile by the European Southern Observatory (ESO) is helping to revolutionize astronomical techniques. For this event the Adler has partnered with Chicago-area institutions including The Field Museum, the University of Chicago, Northwestern University and the University of Illinois at Chicago. Other event partners include Casa Mexico-USA, Aeromexico, Direccion General de Divulgacion de la Ciencia, Evanston Public Library, European Chocolate, Rosa's Horchata, the Mexican Tourism Board and Taco Veloz. "Mi Galaxia es Su Galaxia is a grassroots community effort led by the Adler Planetarium and made possible by the tireless efforts of Latino community members and supporters," said Isabel Carrera, Casa Mexico-USA, Education programs director. "This event is the first of many efforts across numerous institutions that will address the current needs of the Latino community." Statistics Colloquium: Josh Frieman, Fermilab and the University of Chicago, "Probing Cosmic Acceleration with the Dark Energy Survey: Statistical Challenges and Big Data in Cosmology"
The Nobel Prize in Physics for 2011 was awarded for the discovery that the expansion of the Universe is accelerating. Yet the physical origin of cosmic acceleration remains a mystery. 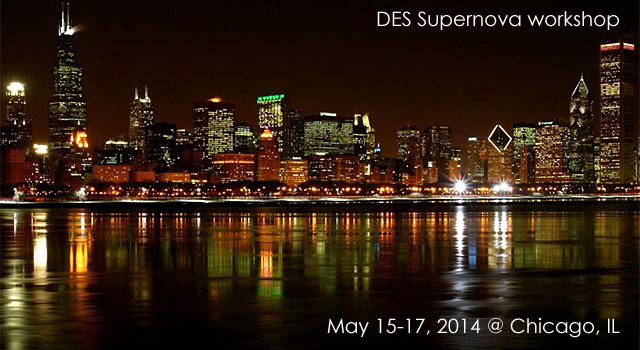 The Dark Energy Survey (DES) aims to address the questions: why is the expansion speeding up? Is cosmic acceleration due to dark energy or does it require a modification of Einstein's General Relativity? DES is addressing these questions by carrying out a cosmological survey of 200 million galaxies over 1/8th of the sky using a new, 570-megapixel, digital camera on a 4-meter telescope in Chile over the next several years. I will overview the DES project, which achieved 'first light' in September 2012 and which just finished its first survey season last month, and present some early results. 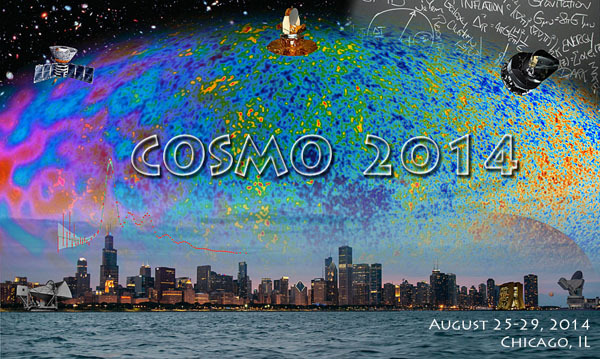 In the process, I will discuss some of the "Big Data" challenges in processing and analyzing the data and highlight a number of the statistical methods being employed to extract useful cosmological information (machine learning, spatial N-point clustering statistics, cluster-finding algorithms, Bayesian classification, MCMC, etc). 79th Compton Lectures: Elise Jennings, "Cosmic Cartography - Exploring an Expanding Universe"
The discovery that the expansion of the Universe is being accelerated by a mysterious force that cosmologists call "Dark Energy" has had an immense impact and is the most exciting area of research in Cosmology today. The 2011 Nobel Prize in physics was awarded to three astronomers who found the first direct evidence of this acceleration by observing the brightness of exploding stars in the Universe. These astonishing observations have ignited a race towards an even bigger discovery - what is Dark Energy? Unravelling the nature of Dark Energy is one of the most important problems facing cosmologists and will answer profound questions about fundamental physics in our Universe. 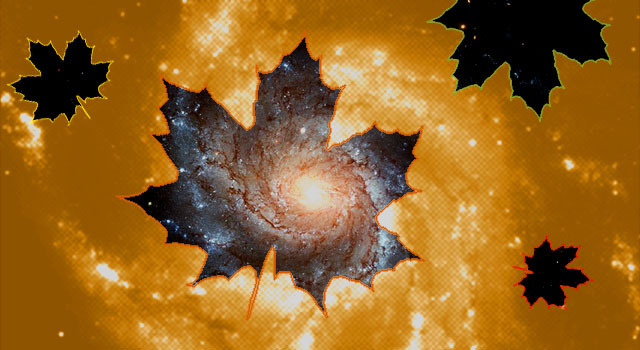 In these lectures Dr. Jennings will describe the cutting-edge of current research which tries to make sense of Dark Energy and the accelerating expansion. 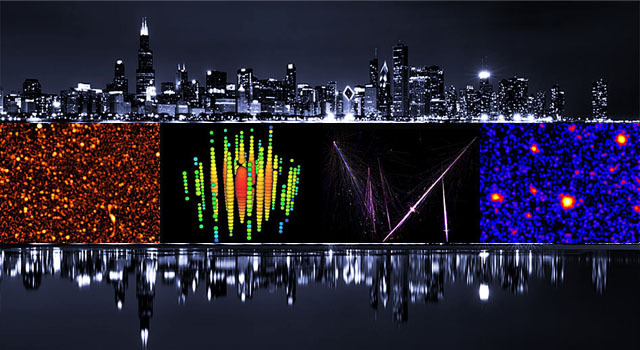 Uncovering the nature of Dark Energy will require exciting cosmic detective work gathering evidence, formulating theories and testing new ideas in the largest laboratory available to us - the Universe. The lectures require no mathematical or scientific background; just bring your curiosity. 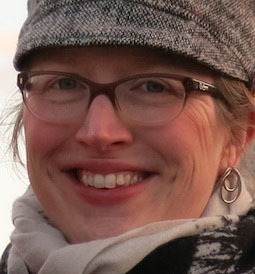 Kathryn Schaffer completed her PhD at the University of Washington studying solar neutrino physics after primarily studying philosophy as an undergraduate. She came to Chicago as a KICP Fellow in 2005, working on data analysis for cosmic microwave background observations with the South Pole Telescope (SPT). In 2008, she decided to veer off course from the "research track," and discovered an unusual faculty position at the School of the Art Institute of Chicago (SAIC). Since 2009, she has been full-time faculty at SAIC, teaching physics and cosmology to art and design students. She continues some research work as part of the SPT collaboration and also contributes to data analysis for nuclear non-proliferation research with a group at Los Alamos National Laboratory. She will discuss the unusual career choices she has made, the pros and cons of taking a teaching-centered position (particularly one that involves teaching to non-science students), and some of the insights she has gained about science and science communication from working with and around artists. THE FIRST PROOF that the universe underwent an almost unimaginably fast expansion when it was only a trillionth of a trillionth of a trillionth of a second old has taken the world by storm. This sudden growth spurt was first theorized more than three decades ago. Yet only last month did astrophysicists reveal the first hard evidence that universe swelled from microscopic to cosmic size in less than the blink of an eye - an announcement so huge that some say dwarfs even the discovery of the Higgs boson. On April 18, two of the scientists who made this groundbreaking discovery will come together for a conversation with two of the pioneering leaders of the field. Together, they will examine the detection of a distinctive, swirling pattern in the universe's first light, what the swirl tells us about that monumental growth spurt, and the many implications on the way we understand the universe around us. 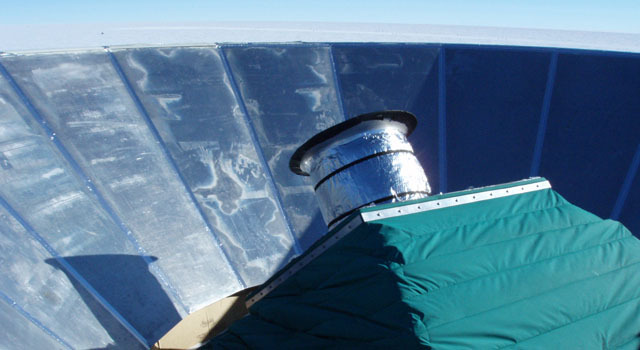 JOHN CARLSTROM leads two experiments that study the universe's first light: the South Pole Telescope in Antarctica and the Sunyaev-Zeldovich Array in California. One of the foremost researchers in this field, Dr. Carlstrom is an expert at extracting information from patterns in light from the early universe. He is the Deputy Director of the Kavli Institute for Cosmological Physics. Dr. Carlstrom is also the S. Chandrasekhar Distinguished Service Professor in Astronomy & Astrophysics and Physics at the University of Chicago. 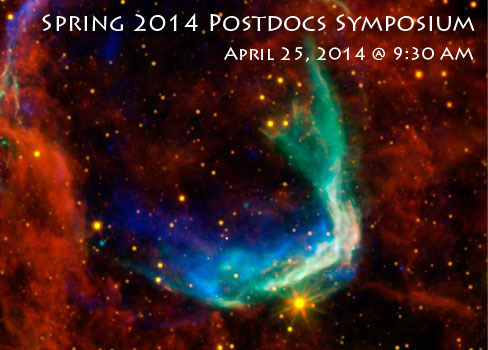 WALTER OGBURN is a member of the BICEP2 team that made this important discovery. 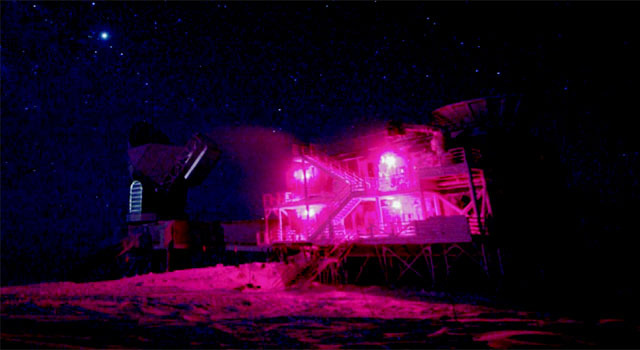 He also conducts work at The Keck Array, a suite of telescopes at the South Pole that also search for twists in the universe's first light. Dr. Ogburn is a postdoctoral researcher at the Kavli Institute for Particle Astrophysics and Cosmology at Stanford University. MICHAEL TURNER (Moderator) is a theoretical cosmologist who works at the intersection of cosmology and elementary particle physics to understand the origin and evolution of the universe. Renowned for his work on inflationary cosmology, the characteristics of dark energy and the nature of dark matter, Dr. Turner is the Director of the Kavli Institute for Cosmological Physics as well as the Bruce V. and Diana M. Rauner Distinguished Service Professor at the University of Chicago. 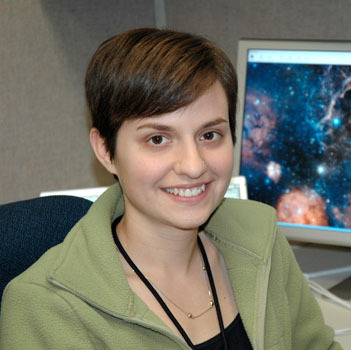 ABIGAIL VIEREGG is an active member of the BICEP2 team. In addition, she works on The Keck Array and the ANITA experiment, which studies ultra-high energy cosmic neutrinos. A member of the Kavli Institute for Cosmological Physics, Dr. Vieregg is also assistant professor at the University of Chicago. Computations in Science Seminar: Robert Rosner, "Clashing cultures: Science and Public Policy in the realm of Climate Change"
As part of its mission, the Panel on Public Affairs (POPA) of the American Physical Society semi-regularly develops statements for the APS on matters of public interest. One such matter is climate change, and over the past 6 months, POPA has been involved in a re-examination of the existing APS statement on climate change. I will discuss our approach, focusing on the dual issues of what we as physicists can say about this topic with some assurance, especially in the realm of prediction - and how do we explain this to a public that is highly polarized on this subject, not tolerant of nuance, and poorly educated on risk assessment and risk tolerance. All of these issues relate closely to how physicists deal with uncertainty quantification of models, and how these may translate - or not - to modeling in the social sciences. Physics colloquium: Adam Riess, "The Hubble Constant and Dark Energy from Supernovae, Cepheids and Parallax"
The Hubble constant remains one of the most important parameters in the cosmological model, setting the size and age scales of the Universe. Present uncertainties in the cosmological model including the nature of dark energy, the properties of neutrinos and the scale of departures from flat geometry can be constrained by measurements of the Hubble constant made to higher precision than was possible with the first generations of Hubble Telescope instruments. Streamlined distances ladders constructed from infrared observations of Cepheids and type Ia supernovae with ruthless attention paid to systematics now provide 3.5% precision and offer the means to do much better. While WFC3 has helped open this new route, its full exploitation can come from a new technique, Parallel Astrometric Spatial Scanning (PASS), to measure parallax distances beyond a kiloparsec. I will review recent and expected progress. KICP special seminar: Silvia Galli, IAP (Paris), "Constraining fundamental physics with Planck"
One of the major challenges of modern cosmology is to understand the nature of dark matter and dark energy. Our poor understanding of these components might even be indicating that physics as we know it today is not sufficient to describe the universe at large scales. In this talk, I will propose two ways to try to answer few of the questions of standard model of cosmology with Planck data. First, I will show how the CMB is a very powerful tool to constrain the characteristics of dark matter particles, as it strongly constrains dark matter annihilation. I will review the general ideas behind searches of dark matter annihilation with the CMB and present current and forecasted results from the Planck satellite. Second (time permitting), I will show how the detection of hundreds of new galaxy clusters through the Sunyaev-Zel'dovich effect by Planck and other ongoing experiments is a potentially powerful new probe of fundamental physics. In particular, the x-ray and SZ observations of these objects can be used to test the value of fundamental constants, i.e. to test the validity of currently known physics, at redshifts z< 1. I will show that current data can constrain the value of the fine structure constant at the level of 0.8%, comparable to CMB constraints. Computations in Science Seminar: Daniel Fabrycky, "Modeling Perturbed Planetary Systems"
The Kepler mission represents a breakthrough in the dynamics of planetary systems. The number of systems with detectably perturbed orbits jumped from two to over a hundred. But the interpretation of these perturbations has lagged the collection of data. I am modeling the systems with high signal-to-noise transit timing variations (TTVs), which have distinctive features beyond parabolas or sine curves. Such features can uniquely determine the mass and orbital parameters of the perturbing planet. In a few systems of multi-transiting planets, I infer the presence of a planet that does not transit. The future transit times of some systems with particularly large TTVs are starting to become uncertain, which I quantify with a Monte Carlo sampling of our dynamical fits. For these systems we are scheduling and obtaining new transit observations, both from the ground and from space observatories, lest we lose knowledge of when to look for transits. With continued m! onitoring , the TTVs in these systems will result in mass-radius measurements for cool exoplanets and inferences on the formation and evolution of exoplanetary systems. 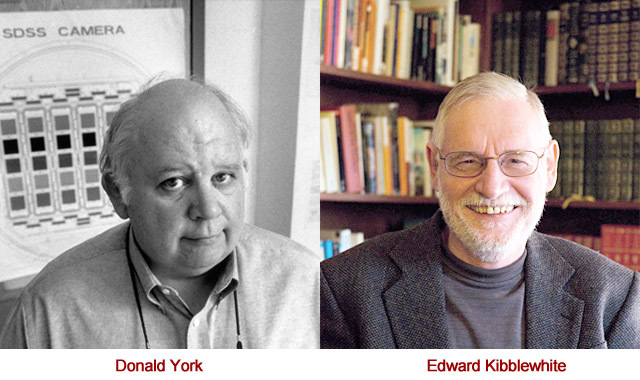 Please join the Department of Astronomy & Astrophysics for a retirement event honoring Donald York and Edward Kibblewhite on Monday June 9. There will be a day-long scientific program at Ida Noyes on Monday June 9th. The program will be immediately followed by a wine and cheese reception from 4 - 6 pm in Ida Noyes. 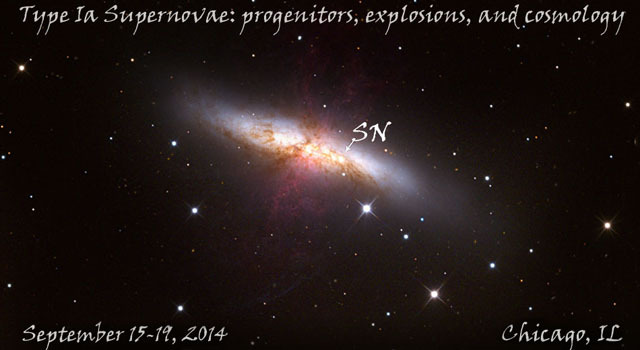 Workshop: "High-Energy Messengers: Connecting the Non-Thermal Extragalactic Backgrounds"
Flash Center Special Seminar: Christian Ott, Caltech, "New Aspects of Core-Collapse Supernova Theory"
Core-collapse supernovae from massive stars are among the most energetic events in the universe. They liberate a mass-energy equivalent of ~15% of a solar mass in the collapse of their progenitor star's core. The majority (~99%) of this energy is carried away by neutrinos, while (~1%) is transferred to the kinetic energy of the explosive outflow. A smaller, yet still tremendous amount of energy is emitted in electromagnetic and gravitational waves. The stellar collapse phenomenon and its range of outcomes pose a formidable challenge to computational modeling. I discuss recent progress made with multi-dimensional simulations and highlight (i) the potential impact of asphericity from unstable convective shell burning in the progenitor star and (ii) first full 3D results on the magnetorotational explosion mechanism that is considered in the context of hyperenergetic core-collapse supernova explosions and long gamma-ray bursts. Finally, I outline how detection of gravitational waves and neutrinos from the next nearby core collapse event can help to observationally probe the dynamics and thermodynamics of the supernova engine. Please join us in honoring Wendy L. Freedman who will be receiving an Honorary of Doctor of Science from the University of Chicago this upcoming 519th Convocation. Wendy L. Freedman, a world leader in astronomy and cosmology, will receive a Doctor of Science honorary degree. Freedman is the Crawford H. Greenewalt Director of the Observatories of the Carnegie Institution of Washington in Pasadena, Calif. Freedman served as scientific leader for a team of 30 astronomers who carried out the Hubble Key Project to measure the current expansion rate of the universe. At the project’s start in the mid-1980s, the age and size of the universe ranged between 10 and 20 billion years. The project’s final results resolved this longstanding debate, determining the age of the universe as 13.7 billion years with an uncertainty of 10 percent. She served as co-leader of the Carnegie Supernova Project to study exploding stars to provide constraints on the nature of dark energy, a mysterious force that appears to be accelerating the expansion of the universe. Currently, Freedman focuses on measuring both the current and past expansion rate of the universe, and on characterizing the nature of dark energy. She is leading a project to use the Spitzer Space Telescope to measure the expansion rate to an accuracy of three percent. Freedman is an elected member of the National Academy of Sciences and of the American Philosophical Society. She also is an elected fellow of the American Academy of Arts and Sciences and of the American Physical Society. Additional honors include the American Physical Society’s Magellanic Prize, as well as the Gruber Cosmology Prize. KICP workshop: "Status and Future of Inflationary Theory"
Open group seminar: Giovanni Morlino, Purdue University,"Non-linear shock acceleration and Gamma-ray emission from Tycho's SNR"
The non-linear diffusive shock acceleration theory is used in order to describe the properties of SN 1572, the Tycho's remnant. By analyzing its multi-wavelength spectrum, we show how Tycho's forward shock is accelerating protons up to ~500 TeV, channeling into cosmic rays more than 10 per cent of its kinetic energy. The theoretical model allows us to take into account self-consistently the dynamical reaction of the accelerated particles, the generation of magnetic fields in the shock proximity and the dynamical reaction of the magnetic field as well. Accounting for all these physical processes, we can explain the gamma-ray spectrum from the GeV up to the TeV band as due to pion decay produced in nuclear collisions by accelerated nuclei scattering against the background gas. We also work out the details of the non-thermal emission due to the accelerated electrons, building up a model simultaneously consistent with Tycho's inferred hydrodynamics, morphology and radio to gamma-ray photon spectrum. Finally I will present how Balmer lines emitted from the remnant's forward shock can also be used to infer the CR acceleration efficiency, which is in agreement with what inferred from the gamma-ray spectrum. Is Gravity a realistic view of the hazards of intergalactic travel, or just a reboot of old movie serials with weightlessness thrown in? Is it an examination of solitude and the human need to connect with others, or a soporific woman's weepie about the pains of unfulfilled motherhood? Gravitas or grasping for meaning? C2ST will join Columbia College Chicago Cinema Art + Science for the first bout in a new season of Cinema Slapdown, as they take on Alfonso Cuarón's Oscar winning excursion to the edge of action movie archetypes. Featuring Cinema Art + Science Associate Professor and Slapdown Superstar Julian ("a spirited glimpse into the eternity of space") Grant versus University of Chicago Cosmologist and Dean of Physical Sciences Edward "Rocky" ("a dispiriting gaze at the edge of clichés") Kolb. Referee'd by Associate Professor and Talk Cinema host Ron Falzone. Workshop: "Structuring Your Scientific Paper"
The University of Chicago Physical Sciences Division and the Chicago Center for Teaching are hosting a special half-day workshop in scientific writing aimed specifically at young researchers - graduate students and postdocs. The workshop is led by Jean-Luc Doumont (PhD Physics, Stanford), an expert in science communication, and will be limited to 50 participants. 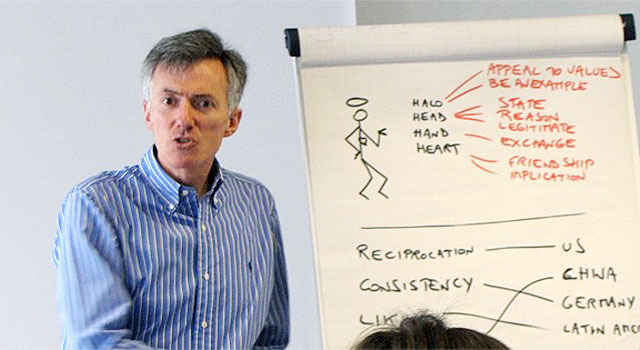 An engineer from the Louvain School of Engineering and PhD in applied physics from Stanford University, Jean-luc Doumont now devotes his time and energy to training engineers, scientists, business people, and other rational minds in effective communication, pedagogy, statistical thinking, and related themes. Articulate, entertaining, and thought-provoking, Doumont is a popular invited instructor worldwide, in particular at international scientific conferences, research laboratories, and research universities. For additional information, visit www.principiae.be. Papers are central to the work of researchers. Well-designed, they efficiently allow each reader to learn only what he or she needs to. Poorly designed, by contrast, they confuse readers, fail to prompt decisions, or remain unread. Based on Jean-luc Doumont's book Trees, maps, and theorems about "effective communication for rational minds," the session shows how to structure scientific papers, theses, and technical reports effectively at all levels to get the readers' attention, facilitate navigation, and, in this way, get the message across. Practically, the session proceeds as a group discussion, on the basis of sample papers sent by the participants ahead of time. This highly interactive approach builds on the participants' previous experience (as authors or as readers), self-adapts to their current level, accommodates non-homogeneous groups, and makes for an engaging and pleasant learning experience. The use of the participants' own examples ensures a relevant discussion and facilitates the transfer of what they have learned to their writing after the session. 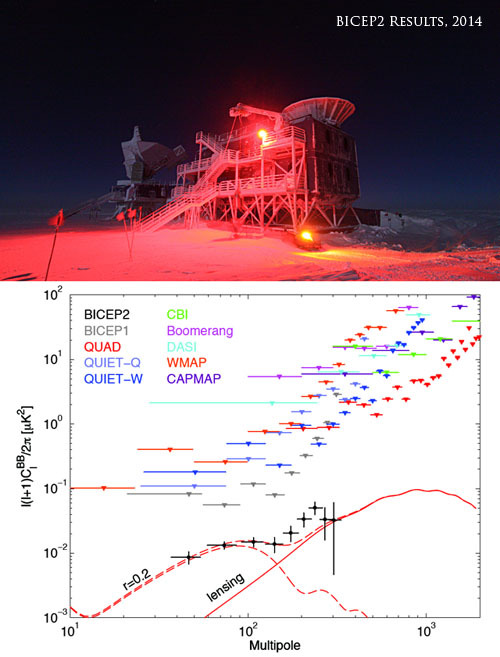 Six months has passed since the results from the BICEP2 experiment electrified the cosmology and broader scientific community (including the UChicago!). Much has happened since (especially here in Chicago). This brief, first-of-the-year seminar will provide a 30 minute update on where we stand in this exciting adventure. The Department will hold our annual autumn quarter welcome reception on Wed. Oct. 1 in KPTC 206, from 4:30 - 6:30 pm. Please join us as we celebrate the start of a new academic year. 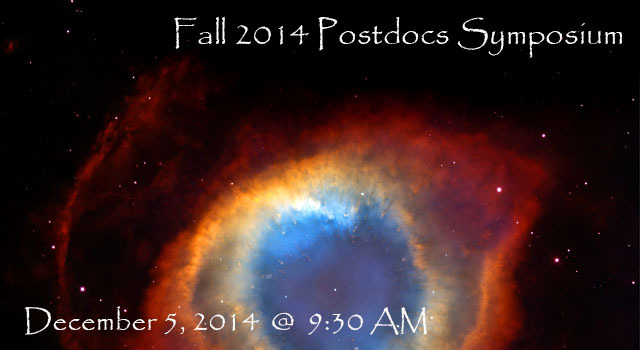 Faculty members, if you have new postdocs/researchers in your groups, please bring them along to be introduced to everyone. Family members are welcome to attend the reception. 80th Compton Lectures: Tim Linden, "Shining Light on the Dark Side of the Universe"
Everything you see around you -- the chair you are sitting on, the grass beneath your feet, and the air you breathe, has a common feature. These objects emit and absorb light. This feature enables us to see, hear, touch, taste and smell the world around us. However, astronomers have discovered over the last 40 years that most of the "stuff" in the universe does not actually interact with light! An astounding 95% of the universe's matter and energy takes an invisible form that cannot be explained by any of the currently known particles. Now, the hunt is on to uncover the nature of these novel substances, aptly named "dark matter" and "dark energy". In these lectures, I will describe the cutting edge research which aims to understand the nature of dark matter and dark energy. 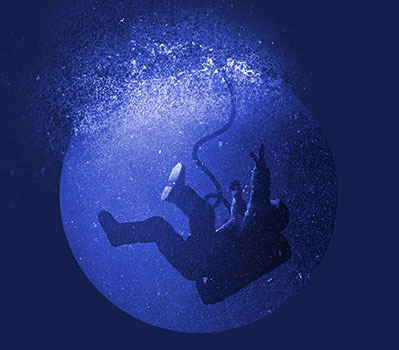 This exciting field spans from observatories placed deep under the ice at the South Pole, to particle detectors on board the International Space Station, to simulations running on some of the world's largest supercomputers. Revealing the dark side of the universe will reshape our understanding of both the history and future of the universe, as well as our place within it. 2014 Brinson Lecture: Victoria M. Kaspi, "Neutron Stars, a Cosmic Gift"
Astrophysicist Victoria M. Kaspi is a world leader on neutron stars and pulsars, the remarkable objects formed during the death of massive stars. She a Professor in the Department of Physics at McGill University and holds the Lorne Trottier Chair in Astrophysics and Cosmology as well as a Canada Research Chair. She obtained her PhD in Physics from Princeton University and held a Hubble Postdoctoral Fellowship at the California Institute of Technology and MIT where she was also faculty. Her honors include the NSERC John C. Polanyi Award and the Killam Research Fellowship in 2010, and the Rutherford Memorial Medal in Physics in 2007. She is Fellow of the Royal Society of Canada, the Royal Society of London and the US National Academy of Sciences. 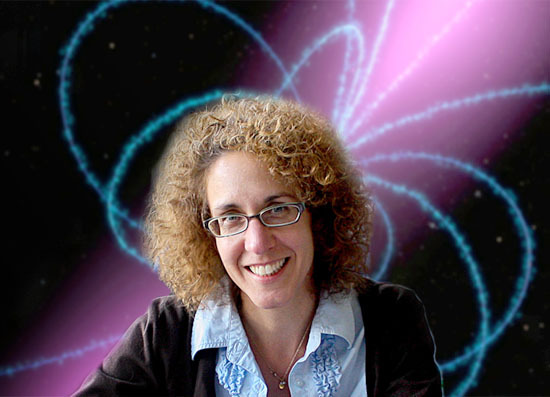 2014 Brinson Lecture: "Neutron Stars, a Cosmic Gift"
Although they are thousands of light years away, neutron stars can act as very precise cosmic beacons; a cosmic gift that sheds light on some of the most interesting problems in modern science. We will explore these strange objects, explain how astronomers are using them to study issues ranging from the origins of the Universe to the very nature of matter; and even listen to the cosmic symphony they create. Ali Vanderveld received her PhD in Physics from Cornell University in 2007, focusing on theoretical cosmology. After two postdocs, first at Caltech and then at KICP, she fell in love with Chicago and wanted to try something new. As such in 2013 she obtained a data scientist position at Groupon, where she now uses the same skills and tools that she once used to study the Universe to study the world of ecommerce. Her work involves answering complex questions with massive heaps of historical data, along with using machine learning techniques to optimize the business. She will discuss the pros and cons of this career change, the day-to-day life of a data scientist in tech, and how one might prepare to make such a transition. Alyssa Goodman, Harvard University, "Visualization of High-Dimensional Data, and the Paper of the Future"
Alyssa Goodman is Professor of Astronomy at Harvard University, and a Research Associate of the Smithsonian Institution. Goodman's research and teaching interests span astronomy, data visualization, and online systems for research and education. Goodman received her undergraduate degree in Physics from MIT in 1984 and a Ph.D. in Physics from Harvard in 1989. She became full professor at Harvard in 1999, and was named a Fellow of the American Association for the Advancement of Science in 2009. 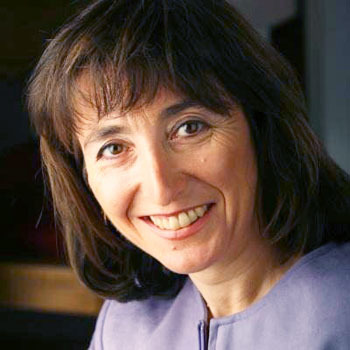 Goodman recently served as Chair of the Astronomy Section of the American Association for the Advancement of Science and on the National Academy's Board on Research Data and Information, and she currently serves on the both the IAU and AAS Working Groups on Astroinformatics and Astrostatistics. Goodman's personal research presently focuses primarily on new ways to visualize and analyze the tremendous data volumes created by large and/or diverse astronomical surveys, like COMPLETE. She is working closely with colleagues at Microsoft Research, helping to expand the use of the WorldWide Telescope program, in both research and in education. 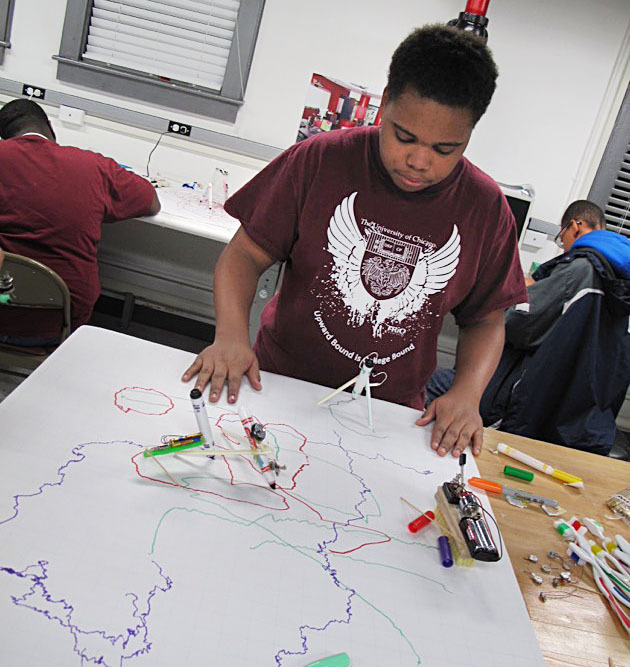 Yerkes Winter Institute: Robotics, Telescopes and S.T.E.A.M. Instructors: Julieta Aguilera, Walter Glogowski, Chen He, Randy Landsberg, Ian Remming, Ted Ressel, Richard Saldanha, Erik Shirkoff, Alanna Simone.